1) Chandler's inspiration flags. 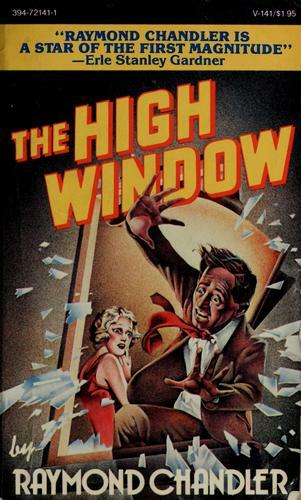 In Chapter Four, needing to give Philip Marlowe and the reader information about the case at hand, Chandler has Marlowe call a friend who happens conveniently to be "a crime reporter on the Chronicle," a hard-boiled convention probably five to ten years out of date by the time The High Window appeared in 1942. The information is forthcoming, Marlowe and the crime reporter friend duly exchange mildly salacious wisecracks, and the reporter disappears, never to return. The reporter's name suggests that Chandler was well aware of the scene's perfunctory nature: Kenny Haste. 2) The word nothing occurs 73 times in the novel, sometimes like a self-mocking drumbeat: "Nothing in that, Marlowe," Marlowe tells himself, "nothing at all. Nothing for you here, nothing." Chandler would engage in morbid crankiness in The Little Sister in 1949. Something similar may be at work in The High Window. 3) On a possibly related note, I detected what I would bet was the inspiration for Ross Macdonald's cringe-inducing pathetic fallacies in The Galton Case. In Macdonald, "Flowers bloomed competitively in the yards." In The High Window, "a small tiled pool glitter(ed) angrily in the sun." Is it fair to blame Chandler's mild excess for Macdonald's more serious sin? Maybe Chandler could be indicted as an accessory before the fact. I thought Darwin would say they did bloom competitively, even without any consciousness of the fact. I agree on glittered angrily, though. No, the giant of Western intellectual history who influenced Macdonald most strongly was Freud rather than Darwin. I have wondered why Macdonald's pathetic fallacies about the suburbs in The Galton Case bother me so much. My guess is that he wrote the book at the beginning of the period when people were still a bit scared of the phenomenon of American suburbs, while I came along just when that fear was wearing off, and folks got used to the suburbs and maybe even realized, if they thought about the matter at all, that suburbanites were no more prone to social pathologies than people who lived in cities or small towns or on farms. So Macdonald comes across as badly dated. Yes, I remember about the Freudian influence on MacDonald. I just meant that as a sentence the first would work for me and the second wouldn't. He was an eager reader of crime fiction, though I don't know if he'd read Chandler. The flowers would also bloom competitively because the houses' owners would try to outdo each others' dieplays. It isn't the fact that "suburbanites were... more prone to social pathologies" that bothered people about suburbs, I think, but the kind of social pathologies they were - and are - perceived as having and the kind of people it showed them to be. Ezra Pound condemned himself for falling for the "stupid suburban prejudice of antisemitism", as if it would have been perfectly fine if it were an urbane prejudice. Seana: Yes, Macdonald (or his protagonist, Lew Archer) definitely saw some horticulture Darwinism at work on those suburban gardens. And I got your distinction between the two passages, though I think you're a little more forgiving of Macdonald's than I am. You're right about why Macdonald saw what he saw in the suburbs, and he makes his views even more explicit elsewhere in the novel. (I quoted more examples in the post to which I linked in the body of this post.) It's not that the passages are wrong-headed, misleading, or inaccurate. It's more that by the time I came along, Malvina Reynolds had written "Little Boxes," and the Monkees were singing "Pleasant Valley Sunday." Alarm about the conformity and social ills of the suburbs were old hat. I enjoyed Ross MacDonald quite a lot when I read him some years ago. Not sure what I'd think now. Thanks, anonymous for Philip Larkin allusion. It's funny but through my father I inherited the perspective of deriding the suburbs even while we lived in them. But having becoming reacquainted with some of my friends from those days recently, I realize that it was something of a false position. I remember the Malvina Reynolds song too, and though I take her point, I think she got it slightly wrong. Living in the same housing doesn't really say a lot about the people living inside those buildings. Seana, Garbhan Downey's new Once Upon the Time in the North West also includes a Philip Larkin allusion if you like that in your crime fiction. A mental block against Ross Macdonald may be a permanent feature of my mental landscape, and this at a time when his reputation is enjoying a resurgence, with a volume in the Library of America and greater presence at crime conventions in recent years. I've read just The Galton Case, which is the source of virtually everything I've had to say about Macdonald, plus one story and part of another novel. I could not get past the opening of that novel because to Chandler-aping was over the top and so joyless. The Galton Case is the most beautifully plotted novel I've, so I know he was gifted, but my antipathy toward may be just one of those things. Your observation about Malvina Reynolds is wise, and it suggests that she was a creature limited to her own time. I would suggest that so was Ross Macdonald in some respects. This is not the case for, say, Hammett or even Chandler, with whom some people say Macdonald belongs in a Big Three of hard-boiled crime writers. My mother has told me that when we moved to a close-in suburb when I was a very young, Peyton Place was very much a part of the cultural currents of the time, and many people thought suburbs were seats of degeneracy and moral decay. If they were, I missed both. I forgot to mention that I plan to attend a Noir at the Bar in New York Sunday whose readers will include one Adrian McKinty. That should be fun. Yes, he's mentioned it over on his blog. Sounds like a lot of fun. I was hoping you'd make it up, or at least that he'd get down to Philadelphia. I remember much talk about Peyton Place when I was growing up, though not sure by who, since I don't think it was my parents' cup of tea. I just looked now to see that the 60s TV series of it starred Mia Farrow and Ryan O'Neal. I knew Farrow was associated with it but not O'Neal. It sounds very dated, but I bet a lot of shows that have come since owe a lot to it without really acknowledging it. If I ever devote serious attention to what the Germans call Rezeptionsgeschichte, or reception history, I'd think about why some authors seem fresh while others seem dated. I made a tentative beginning when I realized that authors from the recent past may seem more dated than authors from remoter eras because we can remember that tail end of their world, the time when the world they wrote had begun to fade, e.g., Ross Macdonald's world, of which I got the end. Hammett's world, on the other hand, is almost totally isolated from my own, so I can see it with a fresher eye. On the other hand, Hammett's contemporaries and immediate successors at Black Mask have dated in a way that Hammett has not, so there are limits to that line of thinking. I think this is part of my problem with Mad Men. I know the era just a little too well to totally buy the writer's version of it. I've seen just one episode of Mad Men, but I could well understand people just a few years younger than we are being just young enough to be removed from that world to find it fresh. I do know that discussion of the show rarely failed to mention that everyone was smoking all the time. Well, one of my school bus drivers when I was in short pants smoked on the job, and I remember public service announcements that warned against smoking in bed. I have to admit that a lot of people my age do like it, but there's something about it that just feels close, but no cigar to me. And of course, that's fine, it's not a documentary, but for some reason it gripes me. I vaguely remember liking the episode that I saw, though--no surprise--its look made the strongest impression. From what I have read about the show, it took one or two aspects of its historical period and built an entire world out of it. No shock that some people who lived through the period would feel vaguely dissatisfied with the show. I can understand anyone liking it, actually. Except I did find the Don Draper character repulsive and it makes me despair for women that many didn't. Christina Hendricks made a big impression. She looked like a magnificent battleship about to be launched. Assuming her character was in the show from the beginning, I wonder if her casting was part of a deliberate effort to anchor the show in an era just before the advent of Twiggy as maybe the first international superstar model. Since I read that the show tried to trace changing mores and attitudes through the 1960s, perhaps my guess is plausible.